Longing to put more than 8-10 miles on one of my Bicycles, I set my alarm to wake me at 5:00 AM on this particular Saturday, as I often do. My intent was to ride to our Gideons prayer breakfast that we hold every Saturday. Yet, as I stumbled about the house for a few moments attempting to get my wits about me, I succumbed to siren call of my bed, still warm from where I too recently had lain. If I had to describe my life, I’d use an expression I heard my boss use once to describe the work of debris crews on a natural disaster job – I go from can to can’t, as does my entire family (wife and kids). These days, especially since returning from deployment, this way of living has nearly destroyed my capacity to get up, especially if I’m not obligated to do so. I digress. 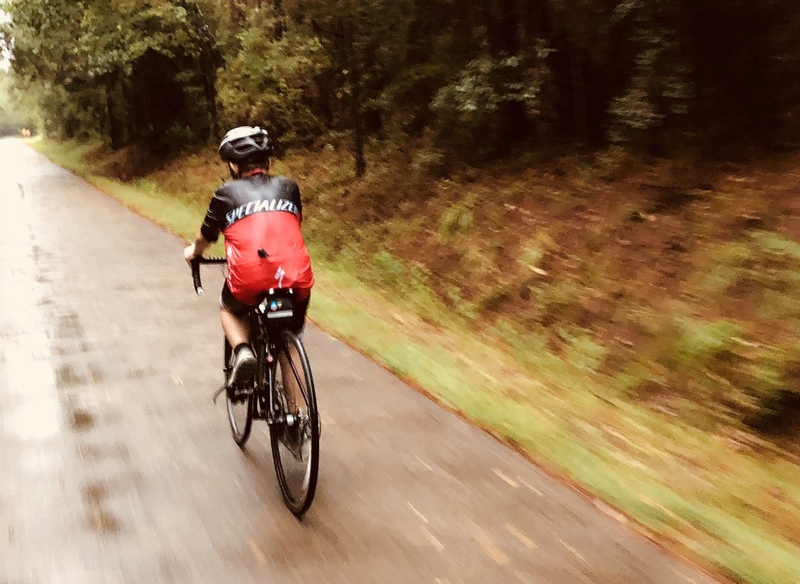 A few hours later, as I set about my normal Saturday morning tasks – coffee, breakfast, laundry, etc., I found the desire to ride still hadn’t left me. After all, I want to do a big cycling event soon, so I’ll need to get in some miles. First things first though: I brought in my bass drum pedal and throne which had been sitting in my truck for over a week so I could work up drum parts for two songs that my band mates in Axiom of Maria had asked me to learn, “Grey” and “REM”. After a decent familiarization with the songs, it was time to ride. I walked into my son, John’s room, and asked if he wanted to go for a bike ride. I wasn’t sure I’d be able to tear him from his lat est task of creating a functioning Star Trek ship in Minecraft. To my surprise, he said yes! I loaded his bike on the bike rack that seems to be, these days, permanently attached to the back of my truck. Next came the question of which of my four road bikes I was going to bring along. 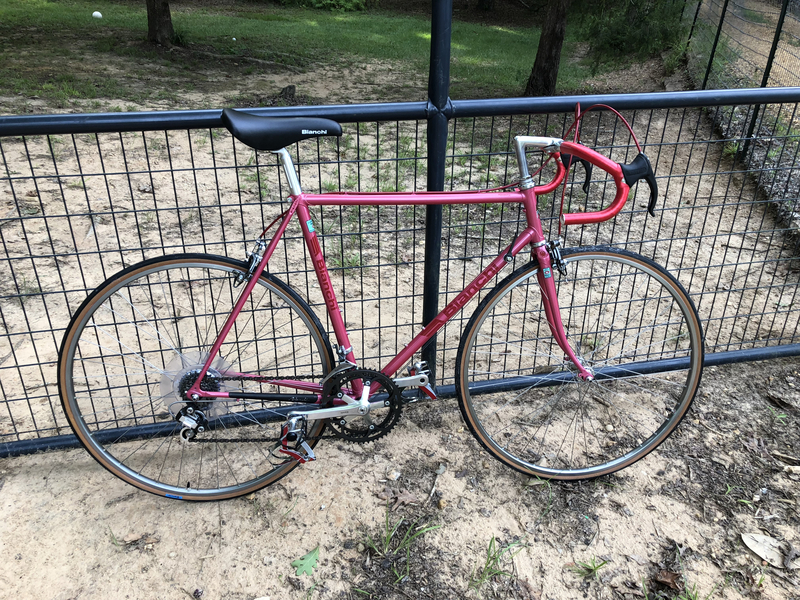 There was my 2016 Bianchi, which would put me on par or better with John’s 2013 Specialized Allez, but I also wanted to ride one of my vintage bikes. I had not long ago finished building, from the ground up, my 1982 Peugeot P8, which I wouldn’t have minded riding. However, what I really wanted to ride was my recently purchased, new-old-stock, new-in box, 1986 Bianchi Squadra. I was torn. I asked John his opinion. He wanted to see me on that 1986 pink Bianchi. I left it in my office so I would have to go get it. After a shower, and again to my surprise, I found John in his cycling kit, ready to go. 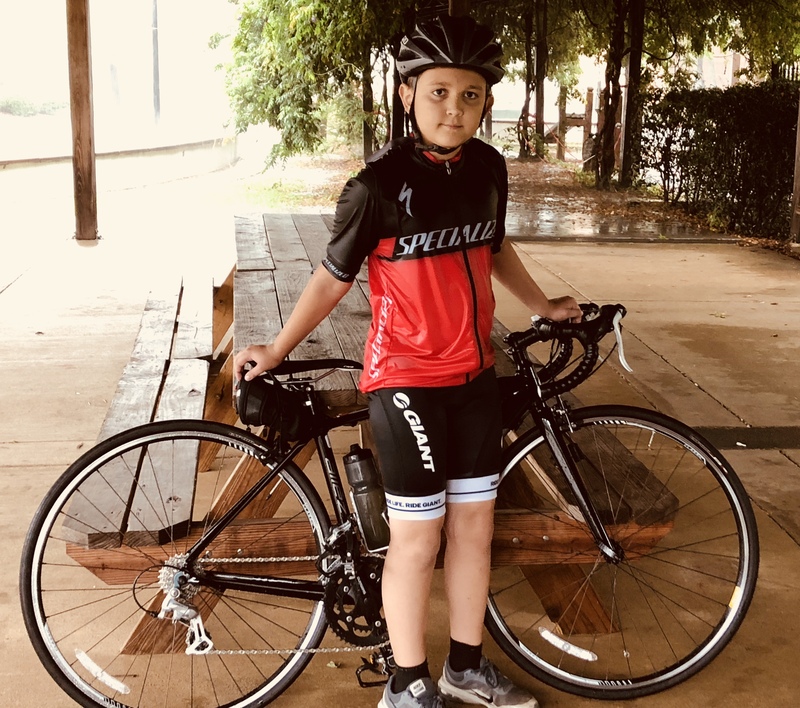 Though, in his small, yet still adult bib shorts and jersey, given to him by a friend at work, he looked like a caricature of a kid wearing his daddy’s clothes. I helped him find his cycling shorts (the ones that actually fit him), and off we went. First, it was to be a quick stop off at the office to get the Electric-Rose Bianchi, then to Epley Station on the Long Leaf Trace. We would then ride from Epley (near Sumrall) to Hattiesburg, eat in Hattiesburg, then ride back. Those plans quickly began to change upon discovering that John had left his water bottles at the house while digging for cycling socks in my clothes basket. 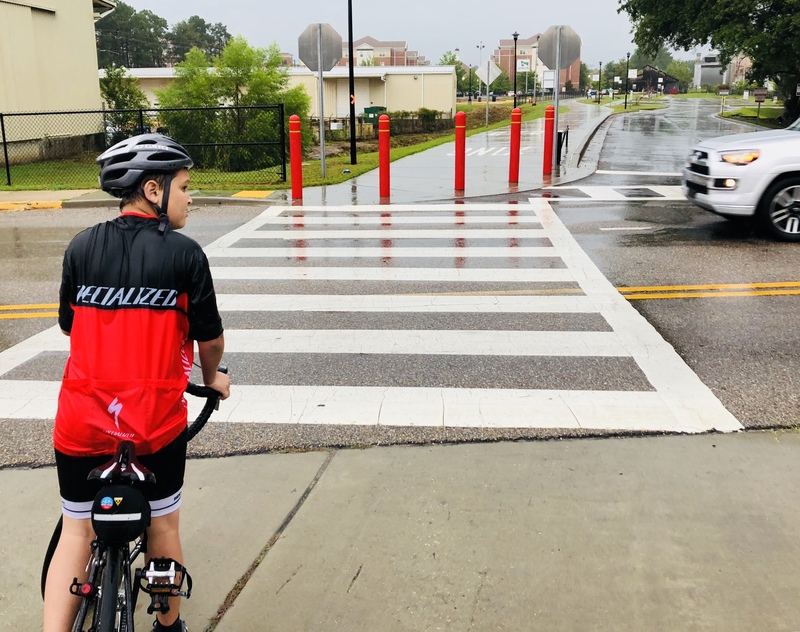 I decided that since John mentioned wanting to get Specialized branded bottles to go with his bike, much in the same way that I have Bianchi bottles, we would go to the Specialized dealer in Hattiesburg. Jed’s Perfect Endurace Bikes happens to be closer to our destination than Moore’s, with whom I usually do business, so that worked out. While we were there, I decided to let John pick out a new jersey that would fit better. As he was perusing the jerseys, the conversation between the lady working at the store (presumably the owner’s wife) and myself turned to involving John in bike racing. I remarked that John would probably rather play Minecraft. She seemed genuinely stoked to see a kid into cycling. We also learned the correct pronunciation of John’s bike model – Allez (pronounced “Allay”, all Frenchy like). I paid for our purchases then we stopped by the gas station and grabbed water and Gatorade. Next, it was off to the trace. Somewhere either before the Bike shop or after the gas station, the sky started making ugly noises, and intermittently began dropping clear liquid. I was hoping the atmospheric calamity was moving toward the west, and away from us. It was still hot and sunny when we reached the trace. I unloaded the bikes and aired up Johns tires while he filled his bottles. After getting our gear situated, we started our journey. Right out of the gate, John surpassed me as I struggled to slip my ultra-modern Bontrager cycling shoes into the shiny chrome toe clips, held down with their red leather straps. I finally got clipped in, and was off! The heat of the day quickly subsided as the cool wind generated my our speed rushed past us (or as we rushed past it). So far, so good. 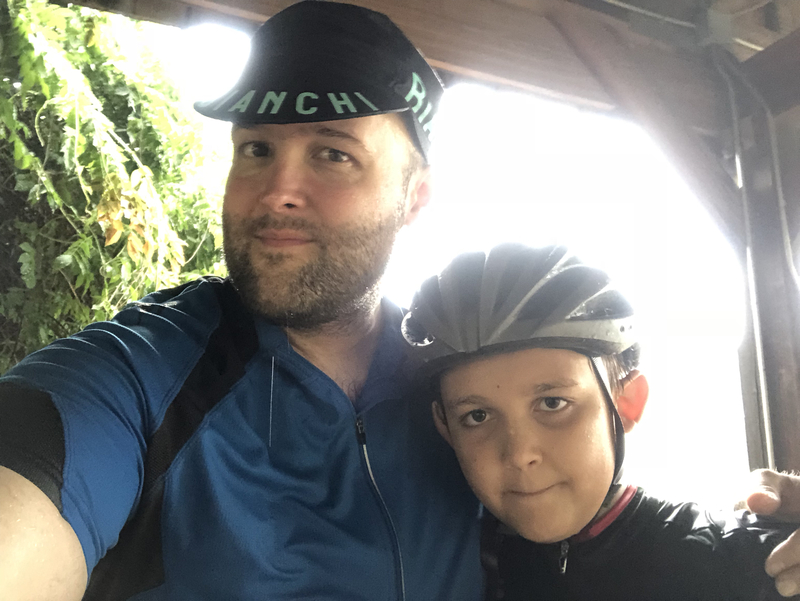 The only real issue I had to deal with was coaxing John into riding a little faster – a fairly consistent issue when road-riding with kids. 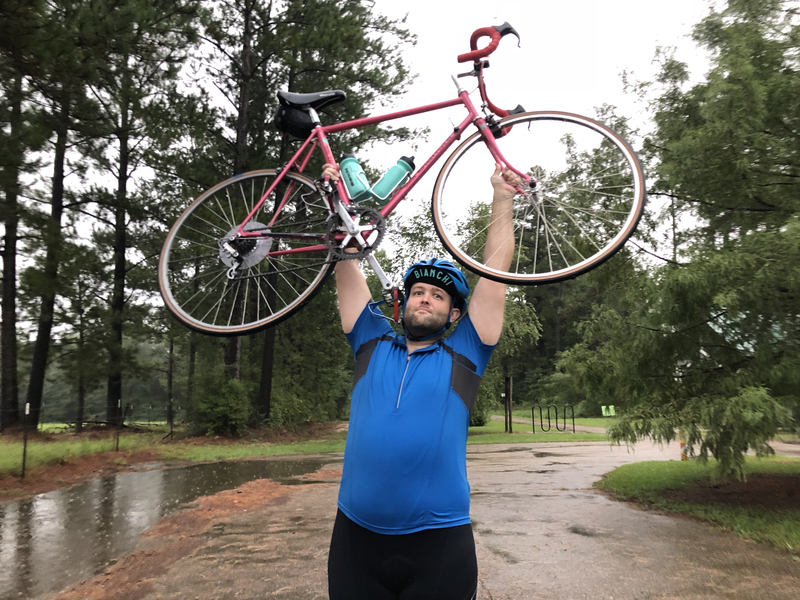 At first, there were many reasons to stop along the way – I need to raise my seatpost. John needed to drink or scratch. I needed to adjust my toe clip straps. As a result, the first few miles were slow-going, something which I find to be somewhat unbearable. After all, while cycling is fun, and it is my hobby, it is also my primary means of exercise. I needed a workout. I was finally able to make some headway by asking John to stay slightly ahead of me. The tires on our two-wheelers whirred as we ran through the freshly deposited water on the trace. I was glad, for it seems we had just missed the rain. We attempted to stop at the restrooms that are situated along the trace, but to our chagrin, they are all apparently closed for construction. I was relived to see that they all have new doors. You see, one of those bathroom doors nearly took my finger off right before an event in Sumrall last year. Perhaps these new doors will be less dangerous. We passed Jackson Road, then, as we neared Hattiesburg, the sky began to grow forbodingly dark, and once again came the aforementioned ugly noises. We could no longer avoid it. It was as though someone in the heavens decided to un-plug the drain on an unimaginably large bath tub. We were drenched. The only reason I was still able to see was because I was wearing my sunglasses. I had to change my breathing so as to not get water up my nose. Occasionally a build-up of water, presumably from behind the bill of my vintage-styled Bianchi cycling cap would trickle down my face and behind my sunglasses. I’d try to remove my sunglasses, briefly, but the rain was too heavy. I pressed my sunglasses tight against my face, which did nothing to stop the salt deposits from where I had previously sweated being washed down my face and into my eyes, stinging them. Up ahead in the distance, I could still see John, despite the very heavy rain. He was performing admirably. I half expected him to stop and seek shelter. We were wet now, no use trying to fix it. We soldiered on. With each road crossing, I’d offer John words of encouragement, “just a bit farther, and there’s a tunnel that we can get under”. Eventually, we sought refuge for a few moments in the tunnel under the junction of 4th and 7th streets. A couple of pedestrians walked under the tunnel, apparently for the same reason. There were a surprising number of runners and cyclists on the trace considering the weather. John and I took the opportunity to take photos and selfies. He seemed to be enjoying himself! The weather showed no signs of dissipating, so we both decided to continue onward for the USM gateway to the trace, which was only a mile or so ahead. Through the driving rain, we finally made it to the gateway, and thus the pavilions there. We stopped for another break. My idea from the beginning was to eat at Glory Bound – a Gyro place in Hattiesburg. Were it not for the buildings in the way, the restaurant would have been in sight at this point, but now that we were soaked to the bone, I wasn’t sure how we would fare in an eatery. We took yet another opportunity to take some photos together, and after the rain slowed a bit, we proceeded down the new extension on the trace, then to the side streets that would lead us to where we were going to dine. As we approached Glory Bound, we found the front of the building woefully lacking in places to chain up a bike. In front of the doors was a small covered area, only large enough to accommodate a few people, held up by two columns that were far too large to wrap locking cables around. However, I recalled seeing around back a ramp and a wooden patio with railings and supports which would be adequate to secure our bikes. I was worried about leaving them in the rain, but then I realized how silly that was considering we’d just been rained on for nearly an hour. 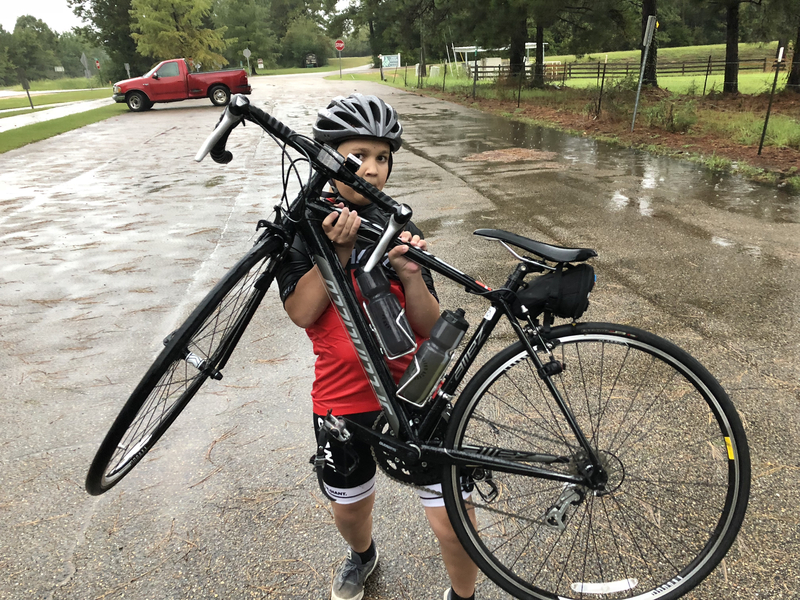 Plus, we probably weren’t finished being rained on if we planned on riding back to Sumrall. We turned off our bike lights, chained up our bikes, then proceeded around to the front to enter the restaurant. When we entered, I inquired of the hostess as to whether being completely soaked was going to be a problem. She assured us it wasn’t, then showed us to our table. It was cool in the restaurant, as one would expect it to be in the middle of the summer in South Mississippi. What self respecting establishment wouldn’t have ice cold A/C blasting? My fat kept me from getting too cold. John, on the other hand, complained of being freezing. I suggested that perhaps he shouldn’t have sucked down his cold lemonade so fast, then told him that he might be able to dry his jersey in the bathroom if they had a hand dryer. He tried to no avail as they didn’t have one. We both ordered regular Gyros, and an appetizer of Mediterranean olive hummus. The first bite of hummus was awful – something I would have never noticed had I not just spent six months on the Middle East. Over there, hummus is smooth, creamy, and rich. Here, it is gritty and bland. I shall have to remember not to order hummus at American restaurants again. The Gyros were quite good though! The food brought back some of our warmth. Typical of restaurants in Mississippi (and probably the US as a whole), every TV in the house was showing a sport of some kind. John seemed intrigued by the fighting taking place on the TV behind me. He said that the women fighters were hitting each other like cats. I texted Theresa to let her know what was going on. I ran through my list of people that I know in Hattiesburg who might be willing to come get us. Ultimately, we decided to just ride back. After all, this was our heroic ride. 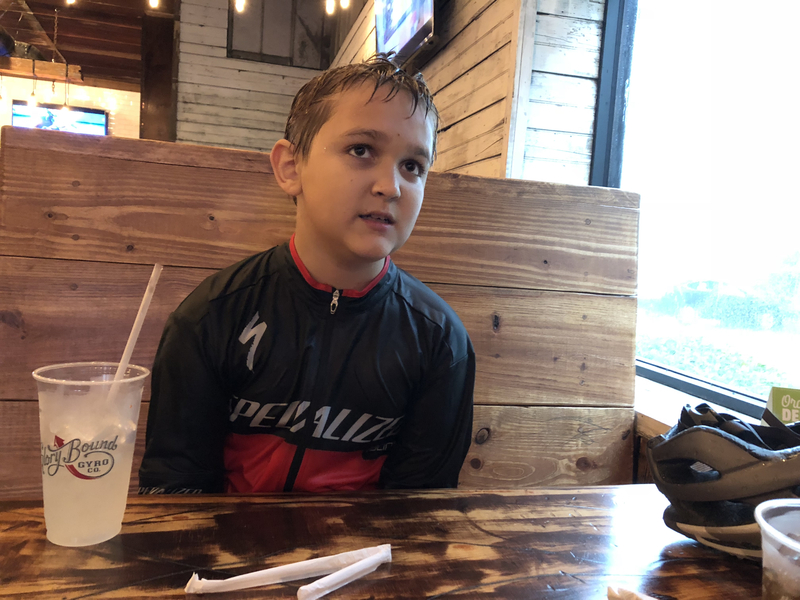 We finished our food, then set about once again on our task of riding against the water falling from the sky. The way back needed none of the coaxing that the initial part of our trip did. John seemed almost invigorated by the rain, as did I. 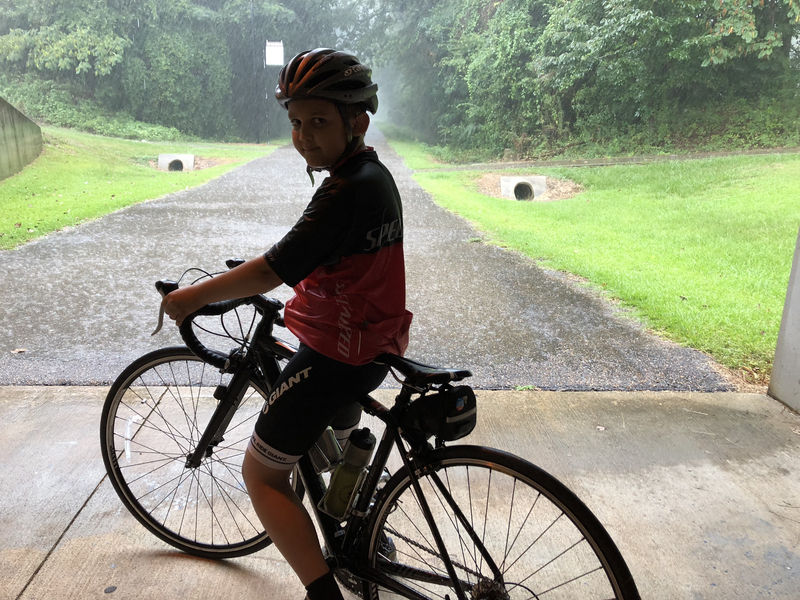 As we conversed along the way, John remarked that despite being completely soaked, this was the best bike ride we’d ever been on. Since all the riders, walkers, and runners had gotten mother nature’s hint and gone home like sensible people, John and I had the trace to ourselves. We each took a lane, I, staying slightly behind John. He was riding in his big ring, and I in the small one. 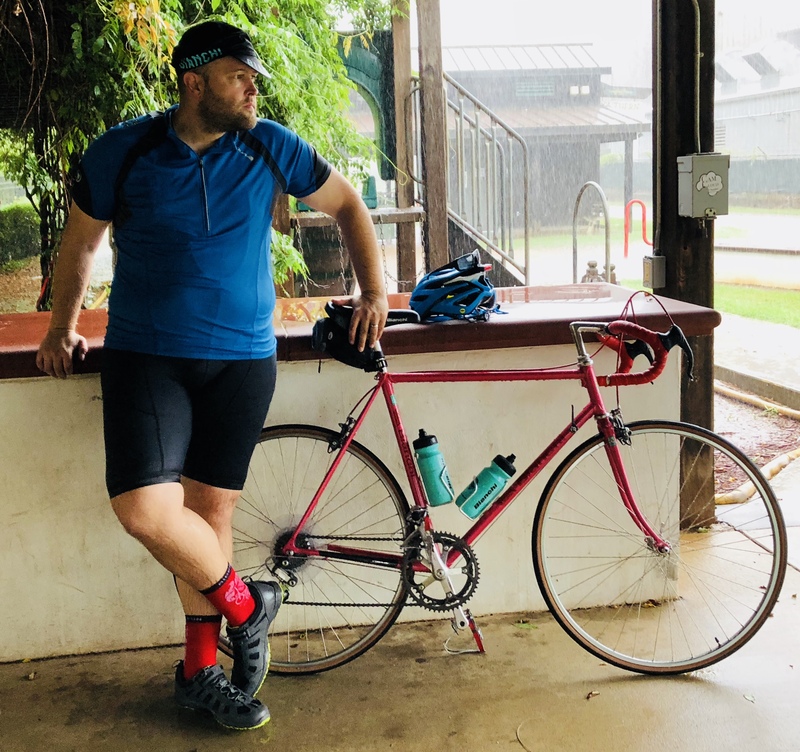 Gearing on those old bikes was significantly different than that of today’s bicycles – I swear my small ring is the size of the big ring on some modern bikes. We kept pace with one another nicely, though occasionally, I had to loudly warn John that his bike was in serious danger of veering into mine. At one point, I looked at John, plowing through the rain in the moments he was able to keep his bike steady, and I thought to myself, “man, John looks freakin’ pro up there.” I managed to pull my phone out and take a picture of him riding. Good job Dad! I’m sure John will remember fondly the ride in the rain you guys shared! This is my fifth year on an Allez.